Hundreds of Palestinian Arabs riot during “Day of Rage” declared by Hamas in Judea, Samaria, and Gaza. 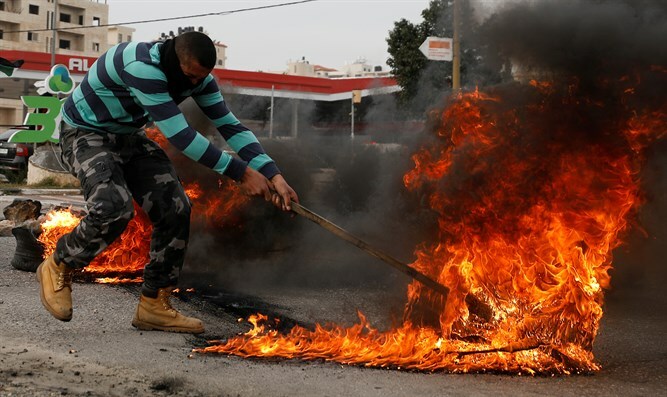 Hundreds of Palestinian Arabs on Friday rioted and clashed with Israeli security forces during a “Day of Rage” in Judea and Samaria, as well as in Gaza. 57 Arabs were reportedly injured, one seriously, in the clashes, reported i24news. Some 850 Palestinian Arabs demonstrated at 13 key flash points throughout Judea and Samaria, the IDF said. The rioters threw rocks and firebombs. The Israeli forces used various means of crowd dispersal. In addition, some 400 Palestinian Arabs took part in demonstrations along the border fence with Gaza, where the rioters threw rocks. The army said it fired live ammunition at the demonstrators on several occasions to disperse crowds. Israeli security forces foiled two terrorist attacks on Friday, one of them in the Binyamin region, where a 15-year-old Palestinian Arab who was armed with a knife was detained near the community of Hashmonaim. In an earlier incident, Border Police arrested an Arab resident of Hevron after he attempted to enter the Cave of the Patriarchs with a knife hidden in his sock. The Hamas terrorist group had declared Friday a "Day of Rage" after a month-long manhunt for Ahmad Nasser Jarrar, the terrorist suspected of murdering Rabbi Raziel Shevach in Havat Gilad, ended in him being eliminated by Israeli security forces on Wednesday.